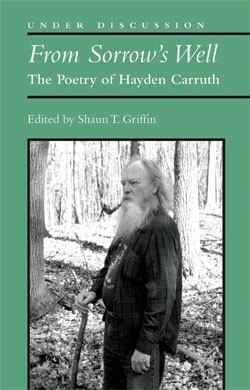 The poet Hayden Carruth (1921-2008) lived in a farmhouse on a back road in Johnson for 20 years. Despite his two dozen books of poetry and spate of prestigious awards — among them a Guggenheim, the Bollingen Prize for Poetry, the Ruth Lilly Poetry Prize, a Lannan Literary Award, a Whiting Writers’ Award, National Endowment for the Arts fellowships and the Vermont Governor’s Award for Excellence in the Arts — some argue he was never fully appreciated. These Carruth enthusiasts feel his reputation as one of America’s greatest poets isn’t firm enough. As a protest against the dimming of Carruth’s poetic light, Shaun Griffin, a friend and fellow poet, has collected and edited a manuscript titled From Sorrow’s Well: The Poetry of Hayden Carruth. Begun in 2002, while Carruth was still alive, with his help and blessing, Griffin’s project became a 600-page opus, which he delivered to five publishers before one accepted. The final book, now published more than a decade later, consists of half the original manuscript and contains contributions from numerous luminaries, including Wendell Berry, Adrienne Rich, Baron Wormser and David Budbill. Griffin, who lives in Nevada and maintained a 30-year correspondence with Carruth, says he conceived the book to right the wrong of underappreciating the poet’s literary importance. From Sorrow’s Well includes essays, interviews and poems in its four sections, each of which describes an aspect of Carruth’s character: Realist, Jazzman, Survivor and Innovator. Griffin renders an overarching sense of the man and the poet, inviting readers both familiar and new to attend his legacy. They can begin by attending a celebration of Carruth’s life and work, with readings from the book, this coming Tuesday. "A Celebration of Hayden Carruth and From Sorrow’s Well": Tuesday, October 29, 8 p.m. at the Vermont Studio Center in Johnson. Free. Rose Marie Carruth, Geof Hewitt, David Budbill, Baron Wormser and Shaun Griffin will read selections from the book. For info, contact Writing Program director Ryan Walsh, 635-2727, ext. 218, or ryan@vermont studiocenter.org. The original print version of this article was headlined "A Poet's Due"